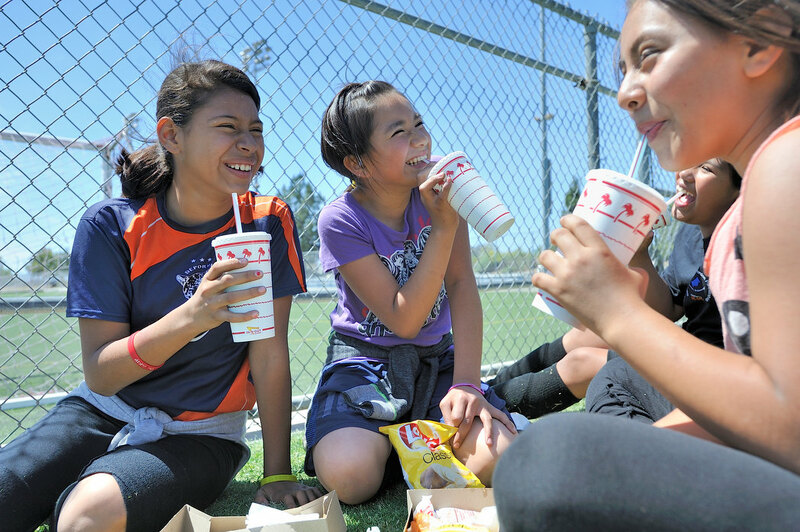 Davis Elementary school kids, Belinda Morales, left, Eva Hernandez, Mariela Morales and Melanie Palacios, right, share a laugh over In-N-Out during during a two-day Gang Prevention and Intervention Partnership (GRIP) camp at Centennial Regional Park on Monday. The camp is for at-risk kids who police and the district attorney are trying to keep out of the gang life. The GRIP camps are part of the larger anti-gang efforts, which authorities say go beyond enforcement tactics such as the much-debated gang injunctions. This entry was posted in Local News on April 6, 2015 by Jeff Gritchen.